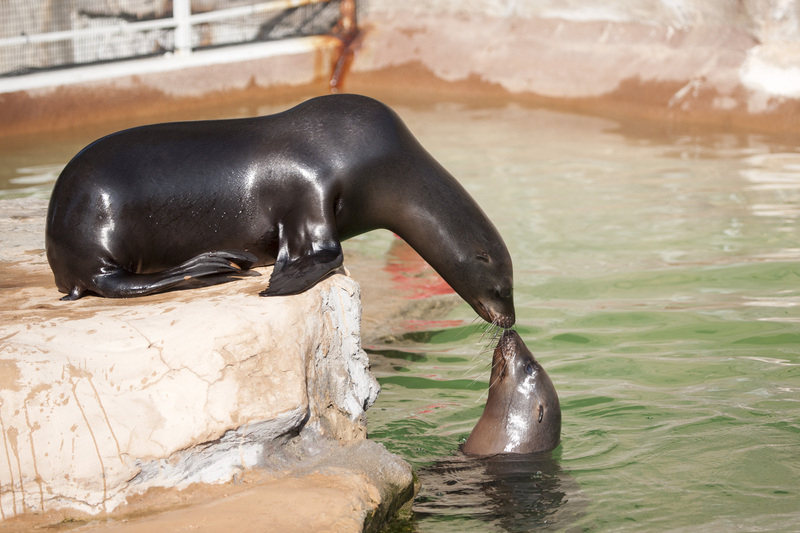 DENVER, CO--(Marketwired - October 08, 2015) - Two, male California sea lion pups that were rescued off the coast of California made their public debut at Denver Zoo this week. Yearlings Duke and Maverick arrived in July from the Six Flags Marine World/Africa USA in Vallejo, California, where they stayed for a short time after being rescued as stranded animals and then rehabilitated. They’ve spent the last few months behind the scenes getting acclimated to their new surroundings, but visitors can see them now as they explore the seal pool in the Zoo’s Northern Shores exhibit, weather permitting. Duke and Maverick were among several young sea lions found stranded and malnourished by staff members of the Pacific Marine Mammal Center (PMMC) in Laguna Beach, California. They were all rescued, rehabilitated and released back into the wild before being found a second time, again in unhealthy condition. There have been a record number of stranded sea lions in 2015, believed to be due to factors such as a shifting current pattern, which moved fish further north and farther out to sea, making them harder to reach. Ultimately determined unable to survive in the wild by the National Marine Fisheries Service, the sea lions were then taken to Six Flags before other facilities adopted them. Duke and Maverick have been together since their first rescue and shared an obvious bond, so Denver Zoo gladly accepted them both. No longer malnourished, Duke and Maverick now weigh about 100 pounds and eat an average of five pounds of herring a day. As adults, they could weigh between 500 and 800 pounds. Keepers say Maverick is an explorer, whereas Duke is more laid back. The duo join the Zoo’s other sea lions, Luci, Nick, Ady and Gunnison, and zookeepers say they are all doing great as they slowly get to know each other. California sea lions are found along the west coast of North America from Baja California to British Columbia. They are highly social animals, gathering in large groups called colonies. Sea lions have streamlined bodies that allow them to swim at speeds of 25 to 30 miles per hour, in addition to remarkable vision that allows them to see well during the day and at night. About Denver Zoo: Denver Zoo brings education alive, providing a unique learning experience that sparks an interest in the natural world for visitors and program participants alike. Home to 4,300 animals representing more than 600 species, the Zoo is accredited by the Association of Zoos and Aquariums (AZA), which assures the highest standards of animal care. A leader in green action, Denver Zoo is the greenest zoo in the country and is dedicated to ensuring the safety of the environment in support of all species by attaining the highest environmental standards. Since 1996, Denver Zoo has participated in about 600 animal conservation projects in 62 countries on all seven continents.